Phone calls, cards, balloons, and gifts are all traditional ways to cheer up a loved one who is ill; however, flowers do double duty, functioning as a way to convey your feelings and also as a sort of therapy for the sick. Many studies have shown that patients use less pain medication and are more positive with flowers and plants in their hospital room. There is even something called flower therapy, where flower essences are taken to alleviate stress and promote health and well-being. I am not at all surprised. As a florist, I see the happiness and health benefits of flowers daily. Nothing makes a person smile like receiving a bouquet of flowers. Are you having a trouble deciding on a get-well bouquet? Here are some great ideas. When giving flowers as a get-well gift, the last thing you want to do is make your loved one feel worse. Stay away from plants that could trigger allergies and strong-smelling flowers that could induce nausea in someone already sick. Carnations, chrysanthemums, and daisies are good choices. Roses that have a light fragrance are also a welcomed choice; is there anyone who doesn’t love roses? If you have a loved one who is in the hospital for just a few days, you may want to consider sending the bouquet to the home instead of the hospital; that way, there will be no stress of gathering up all of the flower arrangements and transporting them back home. Potted plants or bulbs are a good choice as well and are equally as cheerful; they also last longer than bouquets and can be a reminder of how much you care in the months to come. Personally, I think potted plants are a bit easier to care for, since they usually only need to be watered every few days whereas the water in a vase of flowers needs to be changed daily and stems need to be cut. For the very ill, this may be a better choice. A cheery pot of daffodils in spring is just what the doctor ordered. The effect of color on mood has been well-established, and a bouquet can convey a different message depending on the color. Peach, pink, and yellow are nurturing colors. Additionally, yellow in general is often used in get-well bouquets because it is such a cheerful, sunny color that gives hope and happiness; yellow is an instant pick-me-up. Blues, greens, and purples are tranquil colors that induce relaxation and calmness, perfect for someone with anxiety or a lot of stress. Bright, multi-colored flowers generally mean celebration, but they are also very uplifting. Pinks and purples convey a feeling of comfort, understanding, and reassurance to a loved one. In my opinion, the sunflower is one of the cheeriest flowers on earth. Just looking at them makes me smile and think of beautiful, sunny days. One of the meanings of the sunflower is longevity, which is perfect for someone recovering from an illness. 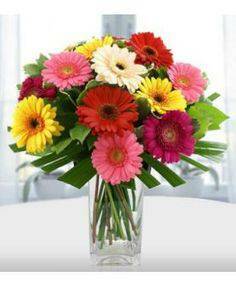 Gerbera daisies are equally cheerful; in fact, they symbolize cheerfulness. They come in a rainbow of bright colors that are sure to cheer anyone. In this day and age, the yellow rose symbolizes friendship, happiness, and caring, and consequently, it is perfect in a get-well bouquet. 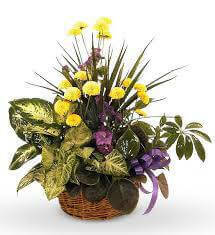 If you are sending flowers to a friend or relative, you probably know their favorite flower or color. This makes it easy for you. Sending a loved one’s favorite flower or a bouquet in their favorite color shows that you are thinking of them, that you listen to them and that you remember things they have said; this alone says a lot about how much you care. You may choose to do an entire bouquet of the same kind of flower, or you could use a variety of flowers to add different meanings and emotions to the bouquet.